The Talex Elite speed camera detector provides information of fixed, average speed, possible mobile and red light cameras and accident blackspots with clear natural voice announcements. The Talex Elite ultilises the unique vehicle profile mode, allowing drivers to select the category of vehicle they are driving, the Talex Elite will then advise the driver of the correct speed limit for their vehicle when in a camera zone. Talex Elite operation is via the supplied 24 key IR (Infra-Red) remote control. Talex Elite comes with a 12 months free subscription period and is ready to use immediately with camera database pre-installed. Talex Elite has been discontinued. Accessories are still available for your Talex Elite click here. 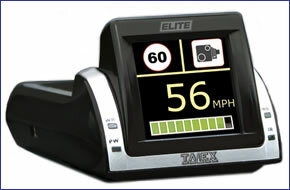 The Talex Elite builds upon the multi award-winning speed camera database used by all Talex based products and adds the unique vehicle profile mode and provides warnings via clear natural voice announcements and full colour OLED screen that gives you more information as you drive including your vehicle speed, camera type and enforced speed limit. The Talex Elite features an OLED 1.5-inch screen, using OLED (organic light-emitting diode) technology Talex Elite overcomes the problem of viewing the screen in bright sunlight. The Talex Elite features a wide range of features which the user can access using the supplied IR (Infra-Red) remote control. The Talex Elite is ready to go with camera database installed and contains GPS co-ordinates of the following speed cameras and road safety hazards: Fixed speed cameras, SPECS speed cameras, Mobile speed cameras, Red light cameras, Congestion charging zones, Saftey camera protection zones, Accident black spots, Steep hills and Sharp bends. Using the Talex Elite remote control the user can enable of disable individual groups of warning types. When stationary the Talex Elite displays the time, when in motion the current vehicle speed is then shown. The Talex Elite also provides date, time, SOS position, maximum speed, elapsed time and distance travelled for each trip. The Talex Elite vehicle profile feature allows you to select from a choice of six different vehicle types including car, cars towing caravans or trialers, buses and coaches, goods vehicles below 7.5tonnes and goods vehicles exceeding 7.5tonnes. Once the vehicle profile mode for your vehicle has been selected Talex Elite will then warn you of the speed limit at speed camera locations for your specific vehicle type e.g. The Talex Elite is simple to install, using the vehicles cigerette lighter and a magnetic mount on the dashboard, the Talex Elite is easy to install,taking seconds to install and remove from your vehicle. The Talex Elite comes with a speed camera database pre-loaded into the unit and is ready to use immediately. Talex Elite also includes free 12 months subscription to the speed camera database and includes a USB PC cable to enable users to update the unit via an internet-enabled computer. Want to add accessories to your Talex Elite? We sell a very limited selection of accessories. Question: I have a Talex elite speed detecter, I would like to buy another, is this still available and if so can you supply and at what price. If no longer available what is the closest to it. Answer: We’ve not sold the Talex speed camera detector range since 2008. We are therefore unsure whether the Talex range is or isn’t available. However, the closest thing we sell is the Snooper MY-SPEED XL. Do you have a question about the Talex Elite? Submit your question via our contact page.